WPRNY streamed this live discussion for AtlasCorps’s Global Alumni Summit 2016 on April 4th, 2016. Shawn Dove of the of Campaign for Black Male Achievement and Tammy Tibbets of She’s the First discuss how to overcome challenging circumstances and leverage diverse networks. 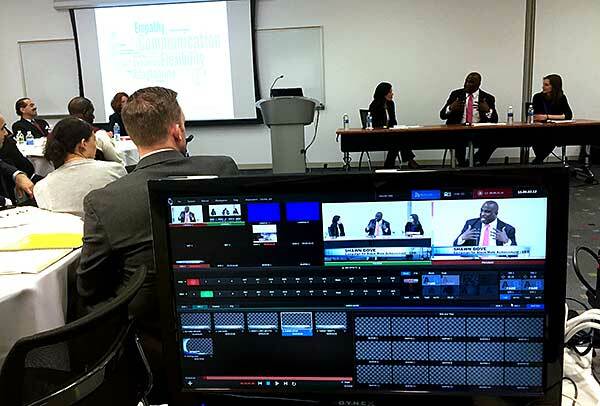 We brought at 2 person Tricaster crew to BMCC downtown NYC. This allowed us to take in several cameras over HDMI and then create live switching using big/little with the powerpoint slides, title graphic overlays. We compressed a 480×240 stream that went out live to Ustream, where viewers all over the world were able to ask questions via twitter. The Tricaster was set up to record the switched master at 720×1280 with overlay and also clean (without graphics). And since we had recored on all cameras, after the event we were in great position to make any edits or fixes if any were needed. The Tricaster worked like a charm and we felt very comfortable using it. We also had a device that would allow us to compress and stream out as backup. We went to BMCC the week before to make sure we could stream out of that room. The whole event went smoothly. The live switch was perfect and no fixes were needed. But if we had put the wrong title font up during the live broadcast, we could have easily fixed this in post by using the clean switched master to cover the mistake. WPRNY has a top notch tricaster crew in NYC standing by to livestream your event. Fill out the form on this page to tell us a bit about what you’re trying to do and we will send you a quick no-obligation hassle free proposal that you can show your team.